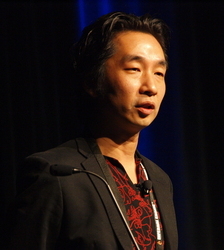 Mr. Yamaoka joined Konami on September 21, 1993, after previously being a freelance music composer. He is most well known for his work for the Silent Hill series of video games, for which he composed all the music and sound effects in the whole series (excluding Silent Hill: Play Novel for the Game Boy Advance and "Esperandote" in Silent Hill, composed by Rika Muranaka). Since Silent Hill 3, he is playing a more important role as the series' producer, also continuing with his music composition working. Yamaoka's sound commonly contains strong melancholy undertones and generally identifies with the dark ambient, industrial, trip-hop and rock genres. Since Silent Hill 3, he also started working in collaboration with Mary Elizabeth McGlynn and Joe Romersa for vocal compositions. Much of his work from previous titles has been compiled for the 2006 Silent Hill movie adaptation, directed by Christophe Gans. His music from Silent Hill 2 was performed live in 2005 at the third Symphonic Game Music Concert in Leipzig, Germany. Yamaoka also performed music from Silent Hill at the world-premiere of Play! A Video Game Symphony on , 2006 in Chicago, Illinois, and accompanied the orchestra with an electric seven-string guitar. He also composed songs for KONAMI's Bemani series, which has also featured tracks from Silent Hill. His first original album, iFUTURELIST, was released in January 2006. He also wrote the theme of 101%, the main show of the French TV channel Nolife.